This post originally appears in the Huffington Post in my new series for Impact, “Social Good Stars.” Thank you to the amazing Beth Kanter! This is the first in a new Impact series, #SocialGoodStars. The people highlighted here are passionate, dedicated philanthropists, strengths to their communities, and social media masters. They also happily share their vast knowledge with others, making them shine as leaders in the Social Good world. Some people stand out as an example of a person who is indeed the bright candle, from whom others can help spread light. Beth Kanter, well-known in nonprofit and social media circles alike, is one of those people. She has been named by Fast Company Magazine as one of the most influential women in technology and one of Business Week’s “Voices of Innovation for Social Media.” She is the author of Beth’s Blog: How Nonprofits Can Use Social Media, one of the longest running and most popular blogs for nonprofits, and the book, “The Networked Nonprofit” with Allison Fine. She is also co-founder of Zoetica Media. Most importantly, Beth spends a lot of time listening to others, curating key information, and sharing it so other people can also be Social Good Stars. 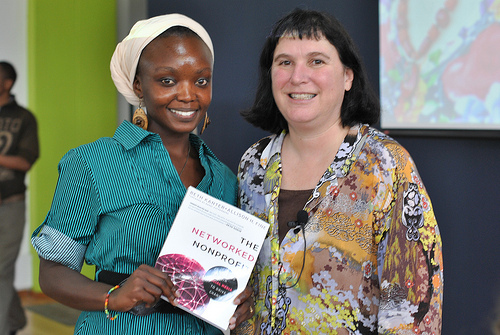 Beth Kanter in Kenya with a winner of her book. With 32 years in nonprofit social good, Beth is the perfect person to answer some pressing questions about current and future trends. Our interview is below. 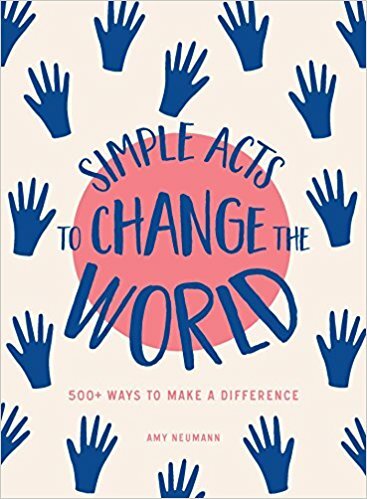 You famously co- authored the book, “The Networked Nonprofit” with Allison Fine, and have worked with social good luminaries such as Claire Diaz-Ortiz of Twitter and Randi Zuckerberg of Facebook. With such legendary background knowledge, can you reveal any social-media-for-social-good trends you see? What’s top of mind at this moment is this stat: In 2020, 40% of the world population will have grown up knowing nothing but the Internet and social networks. Think about that. I’m a baby boomer and my first job was with the Boston Symphony in late 70’s, early 80’s. I was in development and wanted to see examples of membership or annual fund brochures from other symphonies. So, I wrote letters to about 20 of them, asking for a copy. It took a month, but I then had a great collection of ideas — which was good because the annual conference when we could exchange that sort of stuff was six months away. Now, we can learn in real time from our peers. Think how fast ideas are shared and copied from nonprofit to nonprofit. I also watched my son last night do his homework. He is 12. He had to do a PowerPoint on Portugal. He had a PowerPoint document uploaded into Google, was collaborating on it with two friends, and they were talking to each other on Skype. Our world is changing before our eyes and organizations really need to think about what this means for their work. I think about the younger people in nonprofits — and those like free agents outside, and how important it is for nonprofit leaders to empower younger, millenials on staff and outside their walls. Who is a personal hero/ine in the social good space? What makes them unique? This is such a hard question — I have so many heroes/heroines. But, I will name one. Kristin Row-Finkbeiner the co-founder of Momsrising. “Where Moms and people who love them go to change our world.” They are such a fantastic example of working in this agile and transparent way and leveraging social media for on the ground social change. How important is “networking” to you in social media (and IRL)? Has social media made it faster, slower, more or less relevant? Definitely faster. I’ve always been a networker, before the tools — that is seeking people out, introducing people, and learning from the network/community. The challenge when you add online tools is that you can connect to so many more people that you run the risk of having shallow relationships. I have a lot of connections or friends, and I often feel that I don’t get a chance to just to chat and get to know people in a deeper way. These days I get a lot of requests for a lot of things. I find that introducing people to other people where there is a mutual need or potential for reciprocity is a good thing. What’s the “killer app” of social media right now? Tools come and ago — and they change faster than humans. Right now the killer app or type of app is content curation. Less about the tools, more about the process. I’m really excited about the whole concept of people whose job it is to make sense of information on the web. They used to be called journalists — but we have so much information available to us now that the sorting and making sense of it is a job in and of itself. This primer on content curation talks about why. Do you have a favorite “social media success story” for this this year? Yes, grist.org. They use a unique combination of entertaining content and environmental reporting, dubbed the “The Daily Show of the environmental movement.” They have inspired a whole new generation of environmentalists who don’t take themselves so seriously while creating on-the-ground change. What personal projects and charities do you love & support? My main charity is the Sharing Foundation which helps kids in Cambodia. My two kids were adopted from that country – and supporting the organizations is a way to give back. I’m also on the board of Ushahidi , a non-profit tech company that develops free and open source software for information collection, visualization and interactive mapping. I support a number of other organizations in small ways. 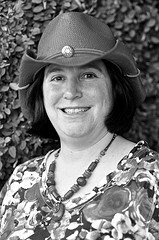 You can learn more about Beth at BethKanter.org and follow her on Twitter @kanter.